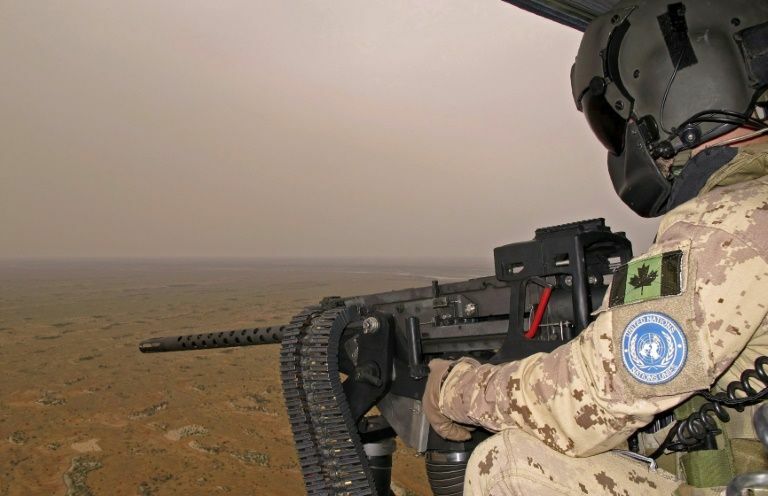 GAO, Mali –Soaring over the Niger river before entering the savannah in northern Mali, a Canadian twin-engined military helicopter is making one of its first forays into the country. Two artillerymen are scanning the ground below when the pilot announces that "one of the gauges has stopped. We only have one engine left". As Canada sends its first peacekeeping force to Africa in 24 years, they are discovering a conflict -- and weather conditions -- unlike anything they have dealt with in a long time. They have joined one of the United Nation's most difficult and dangerous missions -- the 14,000 strong MINUSMA operation in Mali, a linchpin West African country in the vast, arid Sahel region. Flying in northern Mali, which is mostly covered by the Sahara desert, "is like working in the Arctic, you just swap ice for sand and -40 degrees for +40," jokes lieutenant-colonel Chris Morrison, commander of the Canadian air troops in the northeast city of Gao. Aircraft have to operate in extreme conditions in the Sahara and "there are few runways to land on" for repairs or refills, says Morrison, whose previous missions include Bosnia and Afghanistan. While it was Canada that helped mastermind the idea of large-scale UN peacekeeping missions back in the 1950s, it hasn't deployed significant numbers of "Blue Helmet" troops -- as the peacekeepers are known -- for more than a decade. Since last month, a contingent of 250 Canadian soldiers and six helicopters -- two Chinook flying ambulances and four Griffon attack aircraft -- have taken over from German troops in conducting medical evacuations. Not far away, another 4,000 soldiers from non-NATO countries are stationed in the UN "Supercamp". MINUSMA is currently the UN's most dangerous peacekeeping mission. Since it was deployed in 2013, over 170 members have been killed -- more than half the UN soldiers killed during this period around the world. "We want to help the UN, but it is a difficult mission," says Chris McKenna, commander of the Canadian troops in Mali. "It is complicated, but it is what we expected. The environment is harsh, with dust and heat. Working in a multi-lateral, multi-national environment comes with challenges, but we are doing very well," McKenna insists. The soldiers themselves are happy about Canada's return to the Blue Helmets. "It is a good thing to be back," says major Dominique Simard, a helicopter pilot. "We are here to saves lives, it is rewarding." And when they are not out in their helicopters, the soldiers are not allowed to set foot outside Camp Castor. To pass the time, they have internet access, postal services, a cafeteria staffed with Indian cooks, a gym and a bar that does not serve alcohol. But it's not easy being cooped up for so long. "600 metres (2,000 feet) by 600 metres for seven months," one officer complains. "Every day, we are in the sky, 35 feet above the theatre of operations, but we are not going to have terrestrial convoys, we are not equipped for it. That is not our mandate," says McKenna.